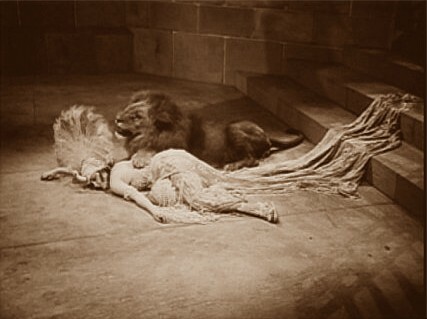 "She's Still Big ~ It's The Pictures That Got Small"
She was so brave that she entered a real lion's den for a film with Cecil B. DeMille. He called her "Young Fellow" as a result for the remainder of her career, stating she had more courage than any man he had ever met. She wanted people to treat her like a star and not just an actress, and she made no excuses for that: "I have decided that when I am a star, I will be every inch and every moment the star. Everybody from the studio gate man to the highest executive will know it." 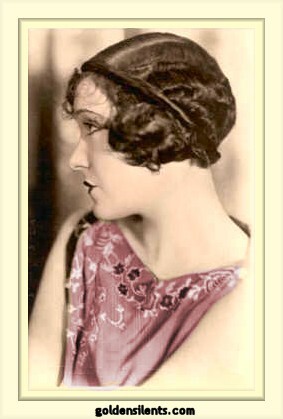 She was the highest salaried woman in films in the mid-1920's, making $250,000 a week. 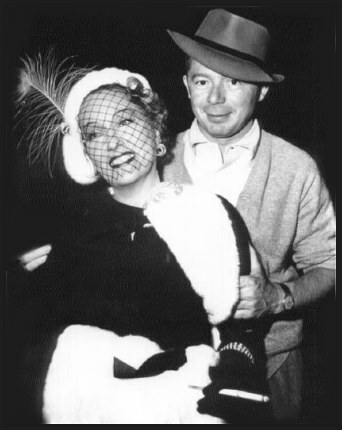 In 1950 when director Billy Wilder needed to cast an older actress for the part of Norma Desmond, in a film called "Sunset Boulevard", few women in Hollywood wanted the role, since it would depict the story of an aged silent movie star ... and none of the aged female silent movie stars still alive in 1950 wanted to look old on film. This one-of-a-kind actress had no trouble signing on to the project. "I don't let age bother me. Whenever I am a year older, everyone else is too." Vanity obviously had its limits when a juicy role was at stake. She was a clothes designer with her own label. You can still find her fashionable women's vintage clothing lines today, selling used on eBay. She founded Essence of Nature Cosmetics. She made television appearances through the 1950's, such as "This Is Your Life", and through the 1960's and 1970's, pushing health foods ....while still smoking cigarettes. 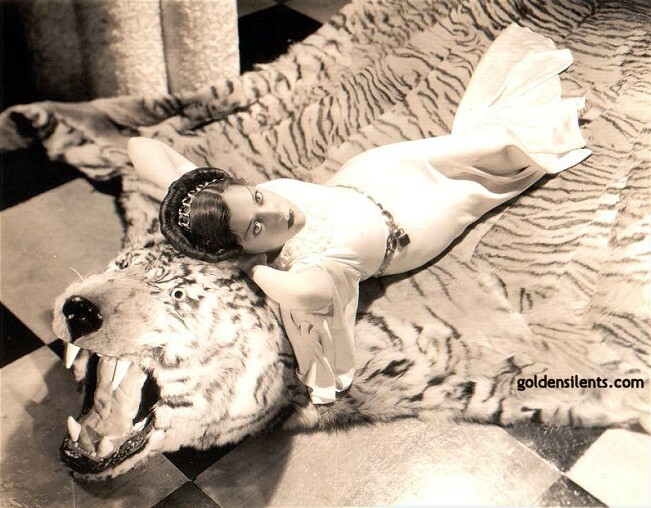 Her name was Gloria Swanson, and there really was no one else like her in the history of film. If you only know her from "Sunset Boulevard" you don't know her at all. Watch some of her silent films to fully appreciate her as an actress. 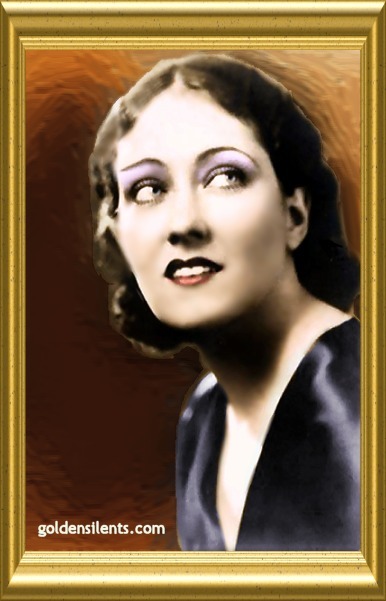 Gloria Swanson was born Gloria May Josephine Svensson in Chicago, Illinois on March 27th, 1897, into a military family which moved frequently. She was educated in Chicago, Puerto Rico, Florida, and San Juan, among other places. At age 18 she broke into the movies in bit parts. 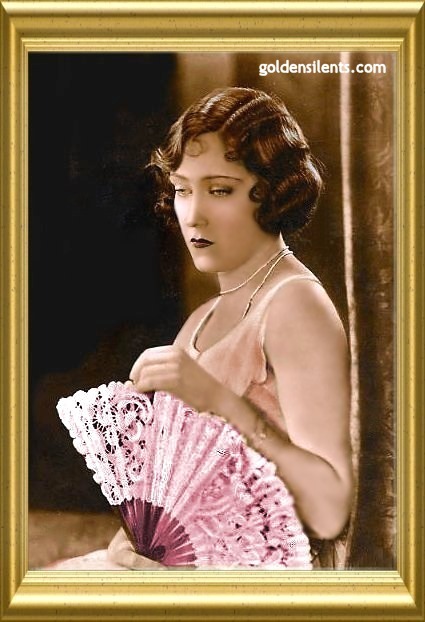 In her early years she played mostly comedic roles and slapstick, which she disliked, but she would do anything to get her foot in the door and to be noticed. 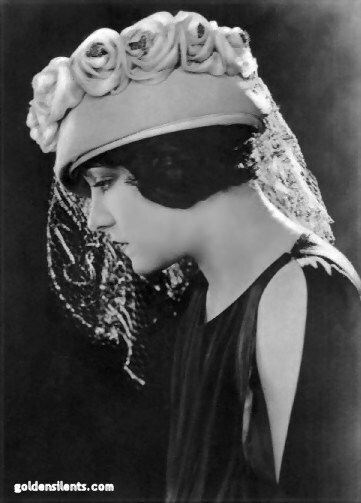 Studios like Essanay, Triangle, and Mack Sennett's Keystone hired her. 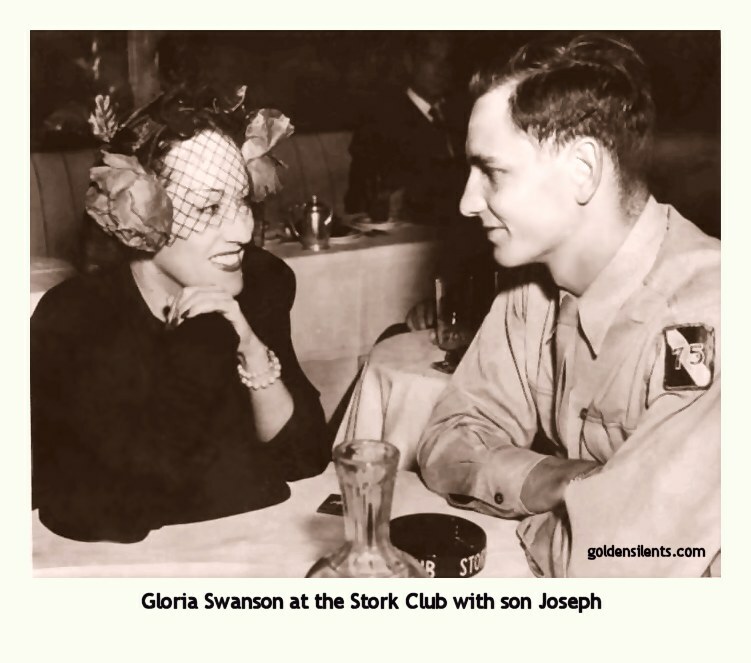 It wasn't until director Cecil B. DeMille noticed Gloria and took her under his wing as a dramatic actress for Famous Players-Lasky that her career began taking off. 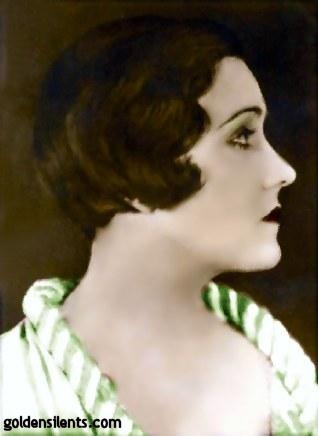 She scored successfully in several films for DeMille in 1919, including "Don't Change Your Husband", "For Better or For Worse", "Male and Female", and then "Why Change Your Wife?" 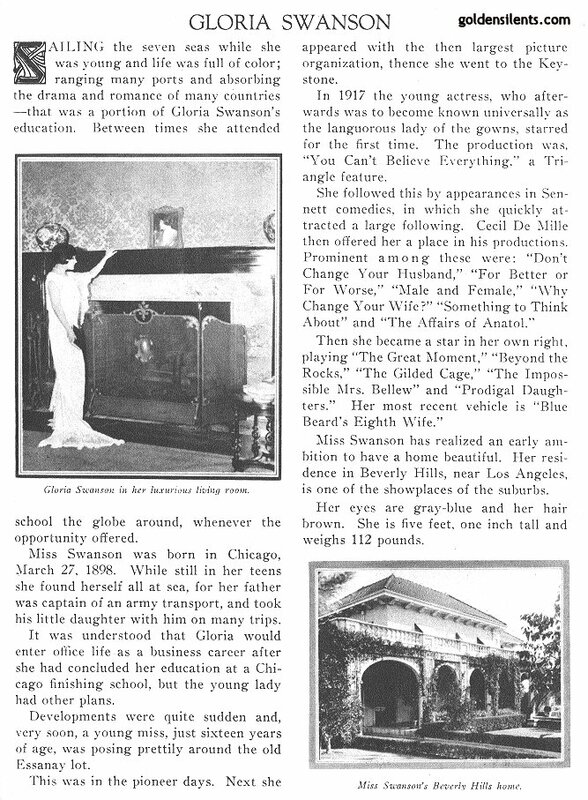 in 1920 (ironic film titles too, since Gloria was to marry seven times). 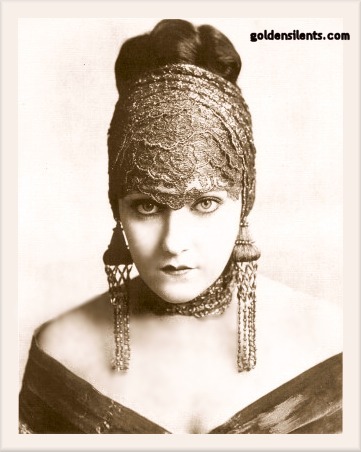 Other films of note for Gloria in the silent years were "The Affairs of Anatol" (1921) with Wallace Reid, "Manhandled" (1924), "Madame Sans-Gêne" (1925), "The Love Of Sunya" (1927) which she produced herself, "Sadie Thompson" (1928) and the unfinished but impressive "Queen Kelly" (1929). 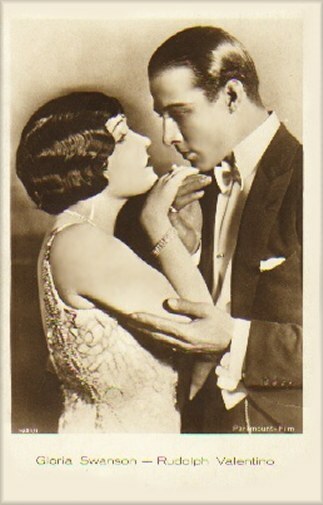 "Beyond The Rocks" (1922) with co-star Rudolph Valentino, once thought lost, turned up recently at a film repository in Europe and is about to be restored and hopefully transferred to DVD for all to enjoy.